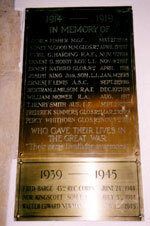 The Roll of Honour is inside the parish church, Stone, Gloucestershire, England. FISHER James Pte 136903 8th Machine Gun Corps died 27 May 1918 age 19. Son of Mark, of Glenroy Cottage Fairford Glos. Commemorated on the Soissons Memorial France. HARDING Cyril George 2nd Lt 103rd Sqdn Royal Air Force died 9 Nov 1918 age 19. Son of Mr F S, of Church House, Stone. Buried in All Saints Stone. HOBBY Ernest George Pte 44046 9th Kings Own Yorkshire Light Infantry died of wounds received in action 8 Nov 1917 in the Northern General Hospital, Leicester age 19. Son of Henry & Martha Kate of Moorslade Falfield Glos and Great Uncle to the collator of this memorial. Buried in Stone Churchyard.